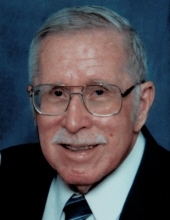 Frankfort- James W. Hilborn III, 90, widower of Doris Ruth Hilborn, passed away Friday, November 23, 2018. He was born in Tiffin, OH to the late James Wesley Hilborn II and Lillian Reiter Hilborn on September 22, 1928. James was a veteran of the US Army, serving during the Korean Conflict. He worked for the Federal Highway Administration as a civil engineer and was an active member of the Franklin Co. senior activity center. He loved tennis, gardening, and round dancing. He is survived by his daughters Karen Hilborn Crabtree (Keith), Frankfort; Sharon Hilborn (Jack Ott), Richmond; his sons James Hilborn IV (Tammy), TN; Robert Hilborn, Frankfort; his brother John Hilborn, OH; his grandchildren Jacob Blevins, Eli Blevins, Taylor Hilborn, Jamie Hilborn, Brandon Hilborn ( Shelby Weber); and his great granddaughter Aphelia Rose Hilborn. Funeral service will be 12:00pm Thursday, November 29, 2018 at Clark Legacy Center, Frankfort. Dr. Phil Hill will officiate. Burial will follow at Frankfort Cemetery. Visitation will be Thursday from 11:00 am until the start of the service at the funeral home. In lieu of flowers, the family requests that memorial contributions be made to the Franklin County Senior Citizens Center or First United Methodist Church. To send flowers or a remembrance gift to the family of James W. Hilborn III, please visit our Tribute Store. "Email Address" would like to share the life celebration of James W. Hilborn III. Click on the "link" to go to share a favorite memory or leave a condolence message for the family.